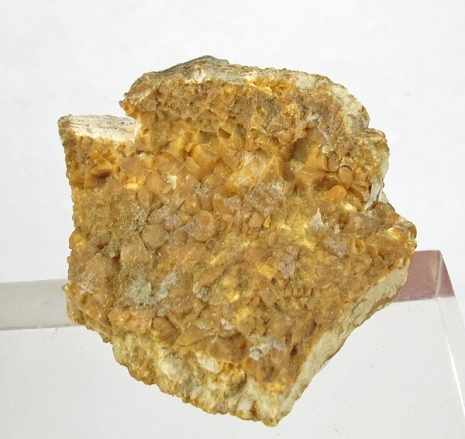 Kerolite: Mineral information, data and localities. Originally reported from Ząbkowice (Frankenstein), Ząbkowice District, Lower Silesia (Dolnośląskie), Poland. Named by Breithaupt in 1823, after waxy appearance. Detailed characterization of material from several localities by Brindley et al. (1977, 1979) implies that kerolite can be regarded as nanocrystalline (they estimate platelets 50 Å thick and 150 Å wide), stacking-disordered talc with a slightly enlarged layer spacing and significant water content,both as interlayer molecules and as hydroxyl groups strongly bound to the Mg silicate structure. Kerolite is not listed as a valid species in the IMA list of minerals, but does not appear to have been formally discredited. Pimelite 3 photos of Kerolite associated with Pimelite on mindat.org. Chalcedony 3 photos of Kerolite associated with Chalcedony on mindat.org. Magnesio-arfvedsonite 2 photos of Kerolite associated with Magnesio-arfvedsonite on mindat.org. Innelite 1 photo of Kerolite associated with Innelite on mindat.org. Orthoclase 1 photo of Kerolite associated with Orthoclase on mindat.org. Edingtonite 1 photo of Kerolite associated with Edingtonite on mindat.org. Loses about 4% of mass as water vapor over 110-700oC; then abruptly loses another 5% (compare macrocrystalline talc, losing very little until 5% loss at 850 oC). Brindley, G.W., Bish, D.L. and Wan, H.-M. (1977) Teh nature of kerolite, its relation to talc and stevensite. Mineralogical Magazine: 41: 443-452. Brindley, G.W., Bish, D.L. and Wan, H.-M. (1979) Compositions, structures, and properties of nickel-containing minerals in the kerolite-pimelite series. American Mineralogist: 64: 615-625. Dosbaba, M., & Novák, M. (2012). Quartz replacement by “kerolite” in graphic quartz–feldspar intergrowths from the Věžná I pegmatite, Czech Republic: a complex desilication process related to episyenitization. The Canadian Mineralogist, 50(6), 1609-1622. Paul, M. (1995): Vorkommen und Typisierung von Chlorit-Vermiculit-Mineralen (einschließlich „Schuchardtit“) aus den lateritischen Ni-Lagerstätten von Callenberg, Sachsen. Z. geol. Wiss., 23, 425-442 (in German). Mikhailov, B.M. (2000): Lithology and Mineral Resources 35(4), 351-364.; Berger, V.I., Singer, D.A., Bliss, J.D., and Moring, B.C., 2011, Ni-Co laterite deposits of the world; database and grade and tonnage models: U.S. Geological Survey Open-File Report 2011-1058. Leveille, Richard J.; Fyfe, William S.; Longstaffe, Fred J. (2000): Unusual secondary Ca-Mg-carbonate-kerolite deposits in basaltic caves, Kauai, Hawaii. Journal of Geology 108, 613-621.